The Princess Jasmine Phoenix tiara from Aristocrat Tiaras is created using Swarovski crystal beads based on a far-eastern phoenix with its long, beautiful and stylish feathers. 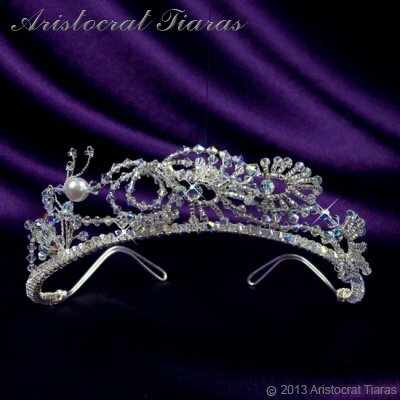 The tiara is covered with crystal AB beads along its visible length to create a truly sparkle effect. This crystal bridal tiara is completely unique and will add an exotic flare to a wedding dress or a prom dress. If you're looking for something different that is eye-catching and stands out in the crowd - this is the perfect tiara for you! Lady Myra earrings and Lady Arabella necklace from our wedding jewellery collection are designed to compliment this crystal tiara.